This is no problem at all, because we also made them available to download online. All you need is to follow the link below and a PDF reader to be able to look at or print the file. Can I wash my Punch'n'Cuddle? Yes, you most certainly can. We know that all the punching and cuddling might take its toll on Punch'n'Cuddle's appearance, so just open the zipper to detach the top part from the base, remove the inner bag with the filling (do not wash this! ), and stuff the cover including the stuffed arms into the washing machine. However, make sure that you don't wash it too hot, otherwise it might shrink. Simply follow the washing instructions on the label attached. Can I test and buy Punch'n'Cuddle in a shop? There are selected stores in various European cities, that have a Punch'n'Cuddle exhibited their shop. Please send us an email to find out which one is the closest to where you are. Also, we regularly show at various exhibitions all over the world. So please watch our blog and like our facebook page to stay in the loop about Punch'n'Cuddle's whereabouts. I live outside Europe - could I still buy a Punch'n'Cuddle? 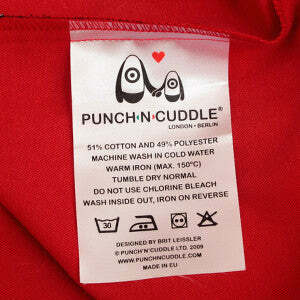 We are happy to send Punch'n'Cuddle to any destination in the world, if possible. Currently, however, you can only place order within Europe via our online shop. If you would like Punch'n'Cuddle to travel to a non-European destination, please contact us and we will do our best to arrange something for you. Here you can get an idea of how much it will cost for Punch'n'Cuddle to travel to European destinations. Delivery times within Germany are 2-3 working days, and within the rest of Europe approximately 5 working days. Serving destinations outside Europe obviously increases shipping costs and times. I would like to buy more than one Punch'n'Cuddle - is this possible? The check out system currently lets you only order one Punch'n'Cuddle at a time. In case you want to order more than one, you can either do multiple single orders or contact us directly to place your order of multiple Punch'n'Cuddles. However, due to not exceed the maximum packaging size of our shipping partner DHL, we can only put one Punch'n'Cuddle in one box, not multiple. Do you have any questions that are not answered here? Just drop us a line and we'll do our best to help.